At 5pm on Friday evening, a dozen or so folks gathered online in a multi-dimensional meeting which included sound, video, and much laughter. Lots of laughter. Many ideas were exchanged about how to best use such meetings in the future. But this first meeting was primarily about getting to know each other a bit better through the spoken word, through smiles and favorite quotes and prayers. It was about planting new seeds of friendship and growing the friendships that have formed through #SpiritChat over the years. The Sanskrit word for ‘friendship’ is maitri. It is also referred to as <a href=”https://en.m.wikipedia.org/wiki/Mettā“>Mettā</a> in the Pali language. How and where does a friendship first come to life? There is usually some common ground necessary for two (or more) people to decide to sit with one another. The sitting can be in silence, a primarily one-way communication (lecture), a two-way conversation, or even a multi-way exchange facilitated by a desire to be in each other’s presence. When friendship takes on the energy of @maggiemistal, the expression of ‘loving kindness’ (@sageandsavvy), or is simply steeped in love (@AwakeningYourTrueSelf) or is a simple yet heart-felt expression of gratitude (@tomarciamae), it transmits the energy of the heart to all present. When it takes on the expression of ‘watching, waiting, working’ (thank you, @mscator), the gentle sharing by @wonderpix, the energy of @maggiemistal, the creativity of @heiddiz, it breathes new life into the sitting. When it is expressed through the Mettā prayer of @intuitiveheal, the wisdom of @southbaysome and the grace of @garygruber, one knows and feels that they are in a special space and time. And so, the seeds of friendship are nurtured. One question, one answer, one chat, one conversation, one smile, one kind gesture, one zoom meeting at a time. It is tough to say what will come next, but for today, the heart feels filled with maitri – the benevolence and radiance of those who shared with all of their heart. The sage Patanjali said in his yoga sutras (aphorisms) – “be friendly towards those who are friendly towards you.” It sounds simple enough, but it isn’t always easy to do (why is that person being friendly? what do they want from me?) However, it is safe to say that we are largely “friendly to all” in the #SpiritChat community, and we extended on that principle in today’s sitting. As I sat watching the radiant colors of the sun, the sky and the clouds merge into the lake waters, it reminded me of the ease with which we all converged on the common ground of friendship today. We came a bit closer to the essence of maitri, of Mettā, of meditation. In our a world that seems to be increasingly fragmented by the day, if not the hour, the notion of oneness may seem anachronistic and out of place. One may even question the relevance, the practical importance of the idea of oneness in today’s world. In addition, one may wonder – how are we to experience oneness with our fellow beings, or even with nature in our busy lives? Let us try and first address the notion that oneness does not belong to our current time and space. What is oneness and what does it mean to us? If we can answer that question, we can then discern its location in time and space. Is it a senses of unity, of common ground with our fellow beings? Is it a desire to live in harmony with nature? Is it an acceptance of the principle that we all share certain unifying traits despite our widely varying differences? If so, what may some of these traits and principles be? Let us now look at the relevance, the practical importance of oneness. Oneness is not to be construed as homogeneity of thought, word or action. Oneness that promotes unity of purpose, say on a team of diverse talents, is indeed relevant to the success of a team or community. In times of conflict, the ‘common-goal’ idea of oneness can be useful to quickly defuse egos and refocus our energies. Can you think of instances in your life where oneness served a practical purpose? The third question is about experiencing oneness in our lives. Once we have had a personal experience of oneness with our fellow beings, with nature, or with divine energy, it is easier to integrate it into our lives. Personal experience turns oneness from an esoteric notion into something tangible. So, how may we have this personal experience? The Indian sage Patanjali offers us three practices that may help. If we can practice any or all of the above, we open ourselves to personal experiences of oneness. The three practices seem fairly straightforward and easy to practice. However, they may not be easy to integrate into our interactions with our ‘enemies’ or those whom we strongly disagree with. How can we experience oneness with them, or can we? How will our world of possibilities expand if we were to find a thread of oneness with our greatest opponents? I invite you to consider the three broad themes of oneness and some of the practices suggested above. How different would our lives be if we were to have a daily persoanl experience with oneness? Imagine the possibilities! P.S. Join us in #SpiritChat on twitter – Sunday October 1st at 9amET/1pmUTC. We will gather to talk about the “possibilites of oneness” and what makes oneness possbile. Namaste. The rain of the past two days is taking a breather. I hear the steady, rhythmic beat of water as it drip off of the roof on to the ground. An orange breasted blackbird comes and perches on the wooden stake that is holding up the silt barrier which prevents the backyard from washing into the culvert which leads to the lake. The father goose is taking his morning swim in the lake as he tries to mark his territory on the waves created by the gusts of wind. There is a stillness of anticipation among the tall trees that are so thick with young leaves that one cannot see more than a dozen rows deep into the forest that is hundreds of feet deep. It is amazing and often mind-boggling when I think about the amount of energy it must take nature and natural systems to emerge, to transition, to synthesize a lively spring from the apparent deep sleep of winter. I often wonder if such synthesis would be possible, or how it would be affected, if there were widespread conflicts within the natural system itself. If nature were to be constantly expending energy to be at war with, and within itself, would such a magical transformation and synthesis be able to bring forth such breathtaking beauty with such alacrity and timeliness? There comes a time in our inner walk when we realize that there may be no more time and energy for us to fritter away. We may begin to ask ourselves about the best way(s) to invest our valuable creative energy and life force. Are we being drained by being at war within and without? Are we overly invested in idle musings and intellectual gymnastics? Are we going to act now to inculcate the spirit of synthesis within and focus on our walk? Are we ready to put our best and most creative high-quality energy into putting the “P” into our daily practice(s)? When winter’s work is over, and spring is imminent, there is rarely any force that can stop the energy transformation to support the spirit of synthesis of new life. As humans, we can choose to transform. Better yet, we have an advantage over nature. We get to choose when our winter is over. We get to choose our own inner path towards a common heart center. We get to choose to walk in a spirit of synthesis, to create channels that energize empathy and compassion. The seeds were planted in us a long time ago. We are perennials. We get to choose when it is time for us to bloom. Join our weekly twitter chat held Sunday May 7th, 2017 with the #SpiritChat community. We will explore the spirit of synthesis which often brings us together… Namaste. The Spirit of Synthesis… emergence of NEW life on the forest floor and the tall trees – as far as the eye can see! To speak of the notion of “creative unity” may seem out of time and place on a day (weekend) on which many are engaged in prayer, service, reflection and remembrance of the events of September 11th from fifteen years ago. However, it is when we are greatly challenged, when we are in a literal and figurative struggle between life and death, that our innate sense of strength is reestablished through our sense of unity as a community. For those who were physically present in the USA on that fateful day, this display of unity – visible everywhere you turned – was unmistakable. But, unity and its display, is often not enough to sustain us as individuals, as communities, as nations. It is a necessary condition, but it is not sufficient. Like everything else that is subject to the vagaries of time and space, that which is brought together and rises with high emotions, can and does get rendered apart and falls when the tide of emotions goes out. The good news is that an event which forges together such intense unity and sense of purpose does reveal that communities are capable of rising together when necessary. We are often not even aware of how strong we are, and our latent strengths are revealed, our resilience is reinforced in times like these. It may seem like poor consolation, and a heavy price indeed, that we have to allow for tragedies to occur in order for them to reveal that eternal principle of joy in life. And it may all seem like a contradiction in the moments – when we are in the middle of it all – that there can be any possible positive outcome from the tragedy. If anything, personal and societal tragedies can cause suffering that causes a break of harmony between our surroundings and the spirit of unity within us. I am sure that we can think of many ways in which to use creativity to restore harmony, to move towards a sense of inner unity in our heart. When we find the unity in our own hearts, it gives us the courage to heal, and in our healing, we reach out and affect the hearts of others around us. Wherever our heart touches the One, in the small or the big, it finds the touch of the infinite – Tagore. So, let us get creative in our prayer, our service, our reflection, our remembrance, our healing and our loving. Let that be our unified tribute that reaches one and all. P.S. I hope you can join us for #SpiritChat on twitter – Sunday, September 11th at 9amET. Share your healing energy of creative unity. Thank you, and Namaste. If the measure of greatness of a life well lived is measured by the tributes that pour out from around the world on their passing, then, President Nelson Mandela was indeed a great man. At the age of 95, surrounded by family, in the country of his birth, the country which he helped end racial discrimination (apartheid) in, the country which he was imprisoned in for almost thirty years – and of which he then became President(!) – President Mandela passed peacefully onto a higher plane. But his life was anything but full of peace. Most of us know (or can learn more) about that with a stroll over to Wikipedia. The struggle, the challenges, the set-backs, the physical and mental battles – they are all well documented in many many books and websites. 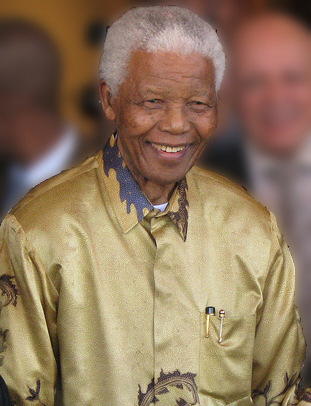 However, that all became “history” in the early 1990s when Madiba (as he is affectionately known by many) was eventually freed, and his lifelong struggle for his ideal (an ideal that he was willing to die for) – that ALL the people in South Africa – blacks and whites alike, should be treated equally – came to a victorious conclusion. However, I believe that what made “Madiba” stand apart, and be respected universally as a “giant among men” was his willingness to forgive to Unify. He forgave those who imprisoned him for the larger part of his “productive” life (from age 44 to age 72) and turned them into his partners! He understood that in order to build a nation that would have long-lasting peace – a unity of hearts, minds and spirits was essential. His love for love, peace, unity and harmony made him recognize that, above all, we all have more within our spirit that unites us, than divides us. It is perhaps that – his Unifying Spirit – that inspires so many to celebrate a life well lived, lived fully, lived with purpose, lived to bring Peace and Unity across the world. Isn’t that what all of us are trying to do ourselves? So, thank you, ‘Madiba’ – for being the mirror, being the light to many. Your light will always shine in millions of hearts, and encourage us to be live our lives so we can be Unifying Spirits too. P.S. It is no coincidence (or is it?) that my daughter’s Christmas concert on Saturday concluded with a rendition of the song… “One Song for Peace” – yet another reminder of all that unites us. P.P.S. This framing post was written for our live twitter conversation on Sunday mornings – Sunday, December 8th at 9am ET. Join us on twitter or at at http://chat.spiritchat.org as we discuss and celebrate all that unites and unifies us. Namaste! Growing up in India, the theme of “Unity in Diversity”, was a common refrain in our social studies and civics text books. For a country with twenty-two states (at the time I was a student), many of them with their own languages (and many more dialects), customs and sub-cultures, interpretations of Hinduism and many other religions, it would seem that theme of “Unity in Diversity” would be indispensable to keep the country together. In fact, I remember writing many essays in middle school and doing many projects celebrating this theme. When I moved to the United States, this country seemed, on the surface, very “homogeneous” as compared to the widespread cultural diversity that I grew up with. The more years I spent here, the more I realized that diversity has many aspects. It manifests differently in different countries and cultures, and, of course, there is tremendous diversity in the USA – one just has to look a little bit beneath the surface. External diversity can conceal internal homogeneity, and vice-versa. Yes, it is indeed a herculean task to weave a thread of Unity in the face of external, visible diversity, as it exists in India. Perhaps an even bigger task is to inculcate some aspects of Unity in the heart of diverse people, diverse cultures and perhaps even diverse religions. This revelation was brought home (again) to me in a wonderful conversation that I had with my good twitter friend, @EdwardColozzi on Friday afternoon. Edward has been a wonderful friend of the #SpiritChat community, almost since the inception of the weekly chat. He is a Career-Life counselor, and a big believer in Unity and the concept of “One Spirit”. The topic of “The Spirit of Diversity” is inspired by our conversation about the discovery of “One Spirit” among our diversities. Well, I believe I have said enough to frame our “Spirit of Diversity” discussion. A few questions that come to mind are – where does this Diversity among us come from? Why is Diversity necessary at all? And what would happen if all this outward Diversity were to disappear? Why is it important to understand the nature, the spirit of Diversity? And where does Love fit into the equation of Diversity and Unity? I invite all of you who have read this far to join us on Sunday May 5th at our regular time of 9amET in our weekly #SpiritChat discussion on twitter. Let us celebrate our Diversity as we contemplate the ideal of Unity. As the month of July comes to a close and I look over the discussions over the past four Sundays, we seem to have covered a wide range of topics – freedom, prosperity, self-discipline and oneness (unity). For those of you who have been with the #SpiritChat community for more than a month, you know that the final Sunday of the month is when we “slow down” a bit. We “slow down” to review the month gone by, and try to tie together the threads of conversations from our weekly Sunday chats. We “slow down” to reflect, and plan our actions for the new month coming ahead. So, this final Sunday of July will be not be much different. We will “slow down” to reflect on July, plan for August. We will reflect on the connections between freedom and prosperity. We will talk about the role of self-discipline in creating prosperity. We may also talk about freedom and the spirit of Oneness and unity. Above all, we will gather for an hour and say hello, listen to each other’s heart and spirit, build on our friendships and relationships. For that is what #SpiritChat is all about. The camaraderie. The Alohas. The Mahalos. The Namastes. The Smiles. The “hello, how was your week”. The “it’s great to see you”. The “oh, it’s so wonderful to hear that”. The “enjoy your Sunday”. The “have a great week ahead”. It is about the knowing that there are real people, from across the world, with diverse social and ethnic backgrounds, different beliefs and religions – who can gather in a space and have a meaningful conversation about any spiritual topic. It is the spirit of connection, with heart and spirit. Perhaps that is why, as we complete our first year and I look back to July 31st 2011, the date of the first weekly #SpiritChat – it is perhaps appropriate that the topic was – “On Slowing Down”. I want to take the opportunity and express my gratitude to every single person who has slowed down to support #SpiritChat over the past year – you all know who you are. I hope that you have made some new friends and grown in spirit with all of us. I know for sure that I have gained tremendously in many areas of my life – so, I thank you all. Join us in our weekly twitter chat (with hashtag #SpiritChat) at our regular hour of 9am ET on Sunday July 29th and share your thoughts about July, and plans for August. I invite you to come and “slow down” with us. Namahalo! In the last week of July of 2011, when I started the twitter chat with the hashtag #SpiritChat with the encouragement of a few good friends, the objective was to have a discussion of spirituality – beyond religion. The response of folks on twitter over the past year has been humbling, and ample proof that spirituality does go beyond religion. One reason for the response from the community is that, in fact, spirituality is based on oneness, and unity of our fundamental core values. We may all look different and have varied backgrounds, follow different vocations and avocations and so on – but there is a thread of oneness, of unity, that binds us all together. In India (the country of my birth and where a grew up), one of the motto’s is – Unity in Diversity. I think the leaders came up with that motto to keep the fabric of the country, which has tremendous diversity (twenty-two official languages recognized in the constitution! ), together in Unity. I learnt a tremendous lesson about unity in diversity from my maternal grandmother when I was in fifth or sixth grade. I was visiting her and she must have gotten wind that I was having trouble getting along with a few folks at school. She invited me into her private kitchen (where you could only enter by invitation), sat me down and fed me one of my favorite parathas (flaky flat bread made on a griddle) stuffed with brown sugar and drizzled with ghee (clarified butter). Then, she raised up her hand, showed me her five sinewy fingers and asked – “do you see these five fingers? Do any of them look alike to you?”. I said, “no beejio” (term of respect for grandmother in India). She continued – “so which of these fingers, although they are all different, is not important? which one would of your fingers would you be willing to lose? You see, people are like that too. They may be different, but they are all important, have something in common”. Needless to say, I still remember that “lesson” in unity, in oneness. I was reminded of this lesson recently due to the #leadfromwithin chat on “diversity”. And it brought questions with it. Is oneness really possible (the Higgs-Boson discovery notwithstanding) in the diverse world of today? If so, how? In what areas is oneness desirable? Does oneness have any disadvantages?